This 27 1/2 in. ninja sword is a mean machine. The stainless steel blade comes with a blackened finish and etched with the warrior's code. 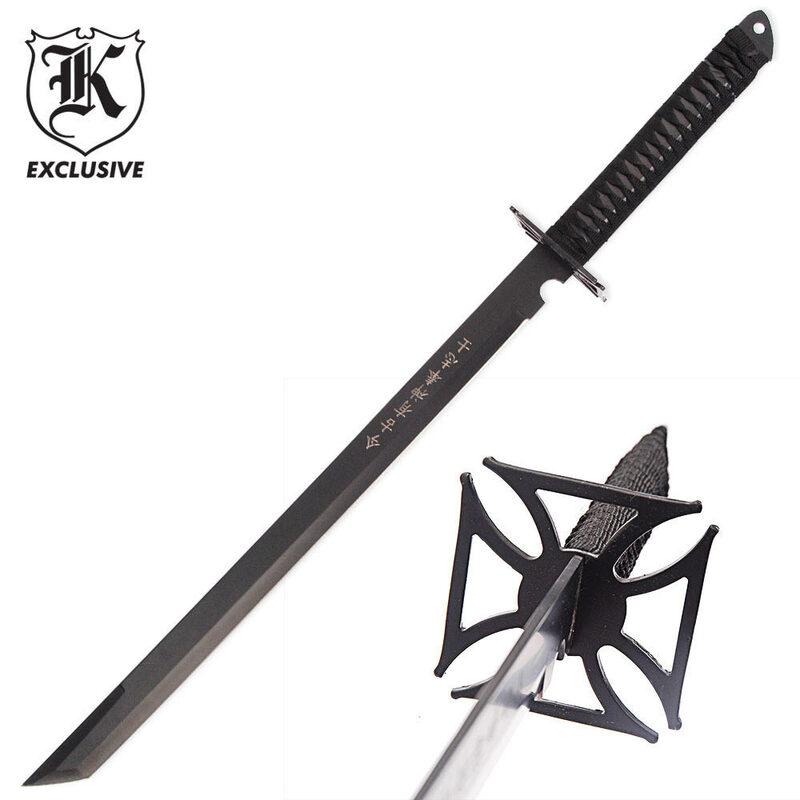 A cross-shaped, steel "chopper" tsuba and cord wrapped handle protect your hands in battle. Includes black nylon sheath. Got it quick and easy. Cheap for the quality in my opinion. Incredibly light, can be wielded in both or single hands. I'm going to buy another for some dual wielding fun! Good sword, but the handle wrapping came off after an hour of use. Response: We would like to apologize for this inconvenience. We would be more than happy to send you out a replacement or a refund, if you would like that please contact customer service at 866-246-7164 we can get that taken care of for you. I didn't thought this $13 sword was this good. I have cut almost everything with it, including plastic, wood, bamboo and even a metal plate. In adition, It is super light weighted, you can swing it all day and carry it effortless anywhere. The handle isn't the best, but it's easy to personalize and totally worth it. 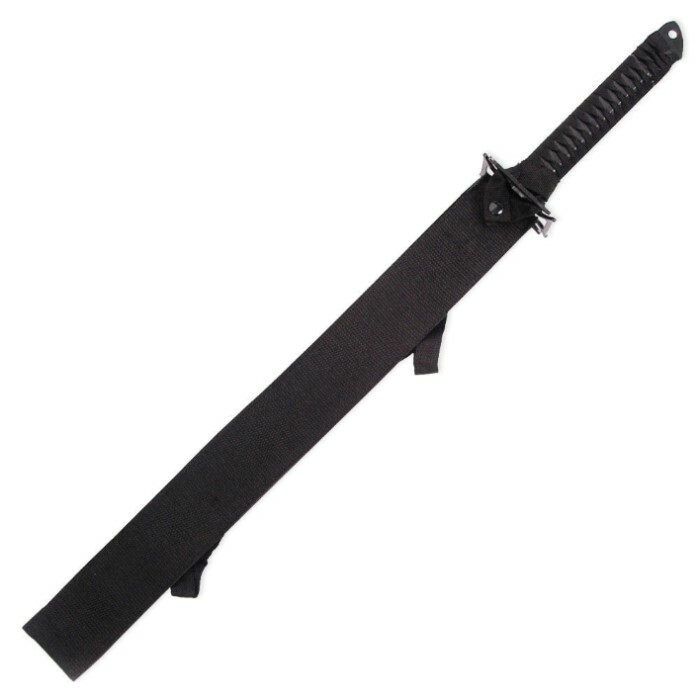 Great sword light weight great for close combat. Easy to store sharp and really cool. I have bought 3 of these swords over the last 2 years and have given them away as gifts. 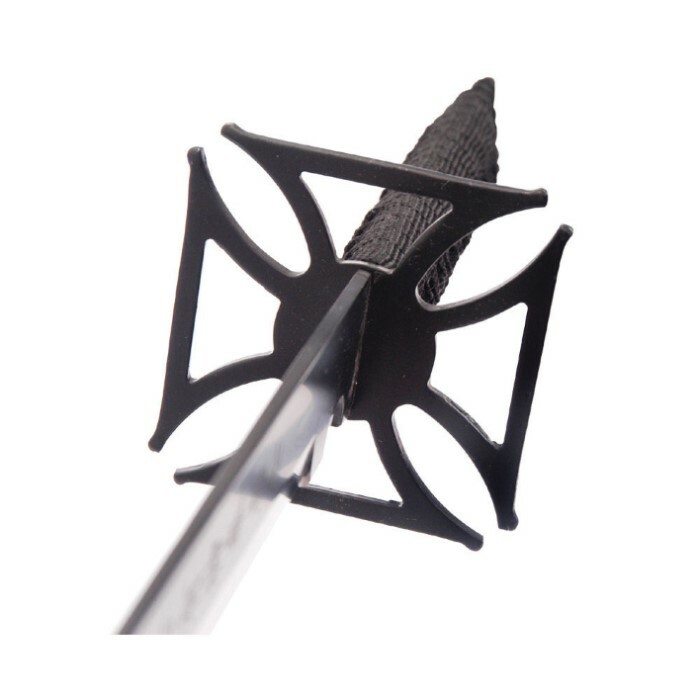 It is a cool little sword , great for chopping through fruits and plastic boodles...it a lot fun..I would use it on wood tho. .just not heavy duty enough but a great sword. The tuba adds the the awesome look of it..it's rare to find a sword with a tuba at this price! It was working fine but the handle bent after an hour of light use. Got this from a list of mixing BOGO items so wouldn't have been a regular choice. This is my first not good review for BK but I'm always truthful. This is either a cheap looking display piece or a toy. It's always near as a last resort but you are gonna have to hack for 30min to do damage. Nylon sheath is cheap. Just not the best quality. But hey guys and girls, you just got a $13 sword that can work for defense if needed (last resort!!!!). I made it sound horrible but the truth is, for $13 it is neat to have and play with. Silver linings!!!!!! Not good, not totally bad. Be mindful this is not a full size Samurai sword so read dimensions. Actually the size makes it easier and more maneuverable. Hey, this might be just the thing for you. I bought this a year ago. Used it to chop very light brush. The Full tang is welded? And not worth a dang. It broke. Total crap. I bought this sword about a year ago when it came the blade was sharp but the cord wrapping was messed up. easy fix I just wrapped it with more cord. I did buy another sword and the handle was fine. Did not see and wields on the blade but the blade is full tang. Will take a better look at the blade. Great sword for the price.